Sisters And Vatican II: A Generational Tug Of War On Oct. 11, 1962, Pope John XXIII opened Vatican II, with a desire to let some fresh air into the Catholic Church. It was a revolution, especially for the nuns who were encouraged to go into the world and help the needy. But now the nuns are being censored, and a generational rift has emerged. Fifty years ago, Pope John XXIII launched a revolution in the Catholic Church. The Second Vatican Council opened on Oct. 11, 1962, with the goal of bringing the church into the modern world. Catholics could now hear the Mass in their local language. Laypeople could take leadership roles in the church. And the church opened conversations with other faiths. For American nuns, Vatican II brought freedoms and controversies that are playing out today. Why Is Vatican II So Important? Maureen Fiedler joined the Sisters of Mercy in September 1962. She was 19 years old and moved into a convent where she had limited contact with the outside world. A month later, Vatican II began. "I found this to be the most exhilarating time in my whole life as a Catholic, because it felt like the petals of a flower were opening, and that there was a whole new fragrance in the air of the church," Fiedler says. Women religious, as they're formally called, became independent. They learned to drive a car and balance a checkbook. Many left their communities to live in apartments, closer to the people they served. And then there were the robes they wore. "We dressed in these black habits from head to toe," says Sister Helen Prejean. "We scared a lot of kids." Prejean was glad to see the habits go. When she entered the Sisters of St. Joseph at age 17, she says, the nuns were cordoned off from the world to pursue holiness and prayer. The call to be engaged with the world was not a call to throw the baby out with the bath water, doctrinally speaking or any other way. Colleen Carroll Campbell, author of "My Sisters the Saints"
"Then Vatican II came along and said, 'Start looking at the signs of the times, look at where the people are suffering, look at where the people are in need,' " Prejean says. "And I'm kind of a story, or an embodiment, of what happened to nuns out of Vatican II, because it brought me eventually to poor people in New Orleans and to death row." Prejean began working with convicted murderers. Her memoir, Dead Man Walking, drew the attention of actors Susan Sarandon and Sean Penn. Sarandon won an Oscar for her portrayal of Prejean in the movie based on her book. Prejean was not unusual. Many sisters threw themselves into social justice ministries and work for the poor. Fiedler, who now hosts the public radio program Interfaith Voices, fasted for 37 days in support of the Equal Rights Amendment. Encouraged by the newfound freedoms, she says, they pushed for more changes. "We thought, 'Well, women priests can't be far behind. A married priesthood can't be far behind,' " Fiedler says. "What we didn't count on, I don't think, was that many forces and people within the Vatican had set their minds to rolling back the changes that Vatican II brought about." But some say the nuns went too far. "The call to be engaged with the world was not a call to throw the baby out with the bath water, doctrinally speaking or in any other way," says Colleen Carroll Campbell, author of My Sisters the Saints and host of a series on the Catholic network EWTN. The Council Fathers intended to clear the underbrush, not light a forest fire; she says a reading of the documents from Vatican II makes that clear. "Nowhere in those documents is there this vision of the church having a radical break with its 2,000-year history, and now, at the Second Vatican Council, everything is up for grabs," Campbell says. For more than a decade, the Vatican waited to see how this tug of war between tradition and modernity would play out, says Colleen McDannell, a historian at the University of Utah and author of The Spirit of Vatican II. Then, John Paul II became pope in 1978. The new pope, McDannell says, "felt Vatican II was important, it was legitimate, but it had been interpreted incorrectly." The first open conflict between the nuns and John Paul II erupted in 1979 during his maiden visit to the United States. After one papal address, Sister Theresa Kane, a leader among the nuns, stood up to address the pope. "The church in its struggle to be faithful to its call for reverence and dignity to all people must respond by providing the possibility of women as persons being included in all ministries of our church," Kane said. About 40 nuns were standing, wearing blue armbands as a symbol of their support for the ordination of women. Maureen Fiedler was there. "You know, I was looking at him that day," she says, laughing. "And it didn't look like he had a smile on his face. He seemed like he was thinking, 'Oh my, nobody vetted this speech, did they?' "
Pope John Paul II favored a more traditional church, where authority resided in Rome, where altar boys were boys, and women religious centered their lives in community prayer. He favored communities such as the Dominican Sisters of St. Cecilia. On a recent evening, eight women from the order gathered in the basement chapel of their house near Dumfries, Va. They wore long white habits, bowing to the cross and to each other as they sang their evening prayers. These women live together, eat together and rise at 4:50 a.m. to pray together, which is the first of several community prayers. 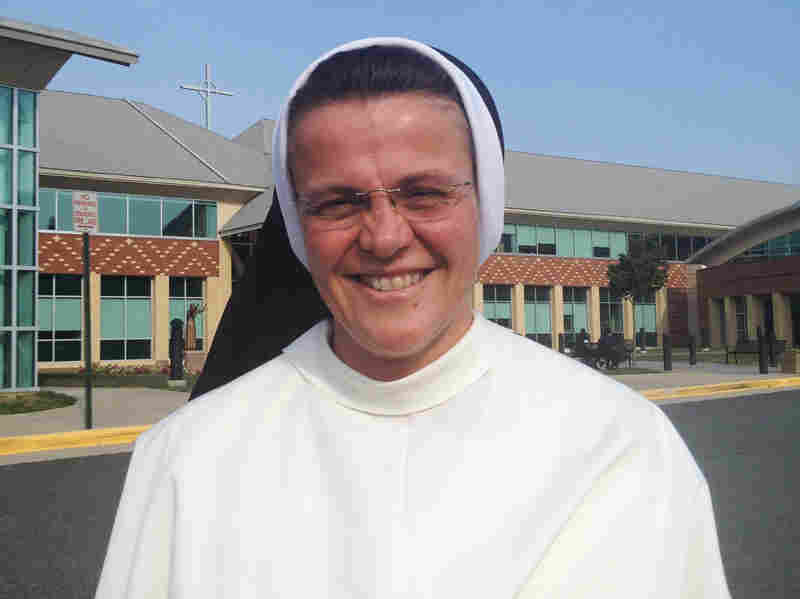 Sister Mary Jordon Hoover, principal of Pope John Paul the Great Catholic High School in Dumfries, Va., is a member of the Dominican Sisters of St. Cecilia. The order falls under the jurisdiction of the Council of Major Superiors of Women Religious, a more conservative organization. Sister Mary Jordan Hoover joined the order in 1991 when she was a 25-year-old schoolteacher. She says she wanted to live a life "set apart for the Lord." "I wasn't attracted to living a religious lifestyle that looked just like the way I was living as a chaste laywoman teaching at a public school," she says. Hoover, the principal of John Paul the Great High School, is part of a fast-growing order based in Nashville, Tenn. Her community illustrates a generational and philosophical split among nuns. Unlike the older sisters shaped by Vatican II, Hoover says many young women are flocking to more conservative orders. "I see that young people want to join congregations that have hours of prayer, times in community, faithfulness to the church, respect for bishops, love of Mary," Hoover says. "All of these things, they don't put young women off. They're attractive." This was John Paul's, and now Pope Benedict XVI's, vision for women religious. "The organizational church wants women to support the organization," McDannell says. "They want women to promote a much more narrow range of social justice issues so that the bishops and the Vatican then can have good foot soldiers in their concerns." But members of the generation shaped by Vatican II don't want to be foot soldiers. Fiedler says she's troubled by the bishops' focus on abortion, contraceptives and homosexuality — and their relative silence about poverty, the budget and war. "A good number of nuns have serious questions about the positions that the bishops put forward, and so they're not anxious to jump in the fray and become, you know, warriors on the bedroom issues, if you will," she says. Those are fighting words — and earlier this year, the Vatican cracked down. It is reorganizing the Leadership Conference of Women Religious, which represents the vast majority of American nuns. It said the group has "serious doctrinal problems" and promotes "radical feminist themes." I know the road I'm on is the road of the Gospel, so that's where my energies are. Sister Helen Prejean, author of "Dead Man Walking"
"I think it was important that this doctrinal assessment be done," says Campbell. "It was important to many lay Catholics as well, because there's been so much confusion about what the church teaches, because so many women religious have either not proclaimed that teaching, or have openly dissented from it." Prejean says she was surprised by the harshness of the Vatican's criticism. "But it didn't affect my life like, 'Oh my goodness, look what's happening here because they did this!' I know the road I'm on is the road of the Gospel, so that's where my energies are," Prejean says. McDannell says the story of the nuns over the past 50 years is not one of soaring freedom and then tragic crackdown. "You know, this notion that somehow you've got this big, bad Vatican with a big stick, smacking these poor, innocent nuns around, infantilizes Catholic sisters," she says. "I tell you, it's an even battle, and if I had to put money on it, I would bet on the sisters." 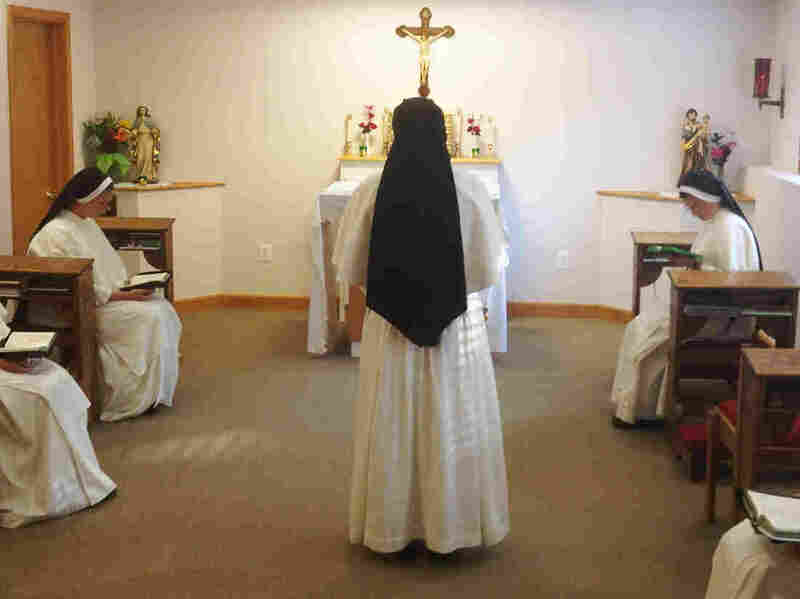 The next generation of sisters may favor a more traditional church, she says, but the spirit of Vatican II is too much a part of their DNA to go back to the old ways.